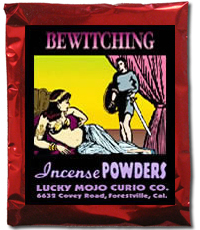 Hi, I wonder if its suitable for me as a male to use bewitching incense/oil to attract women? Or is this product only made for women to use? The scent of Bewitching (which is one of my personal favs by the way) is very floral. I think it would be fine to use as-is as an incense to dress a room, or to smoke yourself in it, but I don't know that I would make the best personal scent oil by itself for a man. To wear it as a scent, you may wish to combine it with something that has a bit more of a masculine/earthy scent, such as John the Conqueror - letting the John the Conqueror be the primary scent-note, and just mixing in a little bit of the Bewitching as an undertone, and to bring in that spiritual effect. Follow Me Girl might be better.